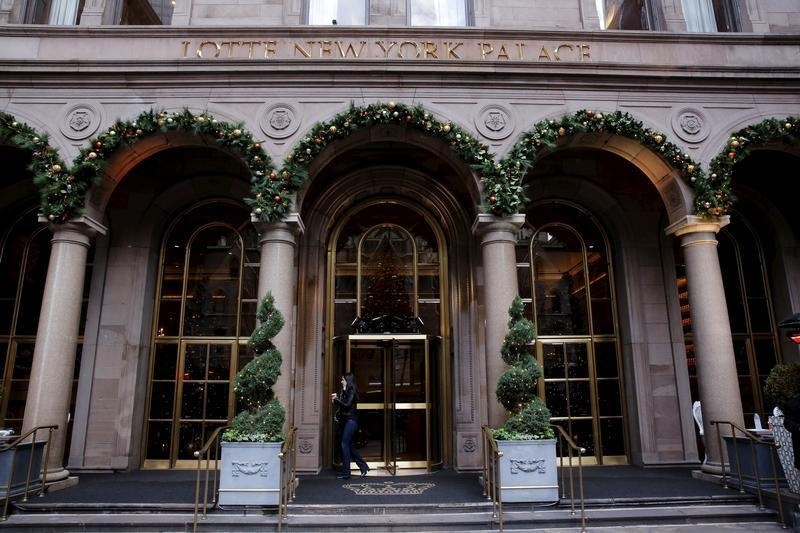 New York, NY - More than a dozen of New York City’s most famed hotels are pledging to get greener. The Waldorf-Astoria New York, the Lotte New York Palace, the Pierre-A Taj Hotel and the Crowne Plaza Times Square are among the 16 city hotels — all currently thronged with tourists visiting New York for the holidays — whose owners have agreed to cut greenhouse gases from their buildings by 30 percent or more in the next decade. Mayor Bill de Blasio’s office is spearheading the NYC Carbon Challenge program, and will announce the hotels’ commitment on Tuesday, his aides told The Associated Press on Monday. “If some of New York’s most iconic hotels can significantly reduce their carbon footprint, anyone can,” the mayor said in a statement. New York is one of the nation’s leading tourist attractions — 56.5 million people visited in 2014 — and administration officials believe the famed hotels are a powerful billboard for the mayor’s environmental program. The so-called Carbon Challenge is part of City Hall’s ambitious plan to reduce all citywide greenhouse gases 80 percent by 2050. The expansion to the 16 hotels — which also include the Grand Hyatt New York, the Westin New York at Times Square and The Peninsula New York among others — is estimated to reduce emissions by 32,000 metric tons and result in an estimated $25 million in energy cost savings. Environmental advocates largely praised the move, suggesting that enlisting a few high-profile structures to the cause could spur others to join. “As the nation’s number one big city destination, the hotels are showing the rest of the world that our city is committed to reducing our carbon emissions and fighting climate change,” said Hervé Houdré, general manager of the InterContinental New York Barclay. City officials said that more than 17 universities, 11 hospitals and nearly 20 residential property management companies — combining for nearly 7 percent of citywide building-based emissions — have already signed on to the mayor’s program. Officials estimate that the program overall will reduce greenhouse gas emissions by 515,000 metric tons — the equivalent of taking 100,000 cars off the roads.